The Twain Shall Meet: ~ The Charm Offensive ~ Harper's Credibility Lost in Space! 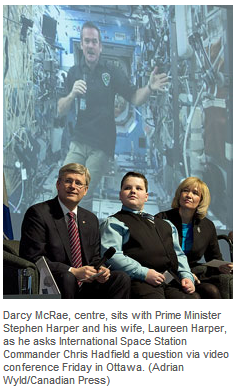 ~ The Charm Offensive ~ Harper's Credibility Lost in Space! Perhaps that is why intelligent Canadians find it so Offensive! Although, almost all Canadians would agree that Canadian astronaut Chris Hadfield is the real McCoy... Hadfield assumed command of the ISS on Wednesday, making him the first Canadian to command the station that orbits more than 300 km above the earth. Hadfield, who arrived at the station in December, has been wowing his Twitter followers with his photos from space and taking questions from school kids across the country about life in space. As I was writing this, CBCNN is on, as always! I just over heard this and need to add it! I seems that Canadian figures skaters Meagan Duhamel and Eric Radford just won a medal at the world figure skating championships and of course CBCNN is now covering it and when the started the interview, told the reporter that she had "just now" received a Tweet from the PM. How "exciting", she said! The Fact that the PMO is watching you and the CBC, so they can send you a Tweet in real time with this much control over the timing that the Prime Minister, (who by way, didn't write this Tweet!) is able to be seen to do that right across Canada is actually frightening. How Exciting! The Prime Minister of Canada's Twitter Account is Nothing but a BOT! "LONDON, Ont. — Canadians Meagan Duhamel and Eric Radford captured a bronze medal in pairs Friday at the world figure skating championships in a result that had onlookers shaking their heads. Duhamel, from Lively, ON, and Radford, from Balmertown, ON registered 204.56 points to improve upon their fifth-place finish in last year’s world championships...."
Anyway, Harper was ^NOT even there. But he still was able to succeed in insinuating himself into the story. The massive manpower and budget of the PMO provides with a huge amount of power to get Harper's more his fair share of the glory of any Canadian in the spotlight! Although, almost all Canadians would agree that Canadian astronaut Chris Hadfield is the real McCoy... Harper is another matter. Harper's Charm Offensive is relentless. The well funded campaign runs 24/7 and it has been doing so for years now. All of the Props He Used? The now infamous Blue Sweater Vest? The kitty? Yo Yo Ma? The Vancouver Olympics? Nickleback? The Chinese Pandas? Randy Bachman? The Amritsar Temple? The fainting student? Brian Adams? Justin Bieber? Taylor Swift? Haiti? Libya? The Queen's Jubilee Medals? Omar Khadr? The child in today's picture? I don't expect that you remember all of them. But many of you will, and many of you will have an longer list. ^NOT expect this to Backfire? Additional reading: A Friend on Facebook writes This! The "chram offensive" is offensive! Great Blog as Always! Hey did you manage to stay afloat? You have made great strides. Shanme if we loss you. Yeah I did (I mean, I did scrap through March). But it's a recurring thing every month. I need to find a way to make my living without begging. Although I do offer all lot of me for the little money this generates, Lol! There is a way around this anonymous thing. Just sign it, Unless of course your the "the only Guy or Gal who read it from B.C.! I have often wondered who my B.C. reader was, Lol! Gee I am liking this reply thingy!